. : Farm Forest Line - Pruning - the treatment of individual trees :. An important aspect of silviculture is the potential to manipulate growth, form and productivity of individual trees by direct treatment. Pruning the canopy or roots, coppicing, the application of chemicals and hormones, and other interventions can, if carefully timed, change the pattern of growth and improve the value of a tree for its intended use. Of these methods, pruning of branches for enhanced wood quality is the most relevant to farm foresters. Branches on the trunk leave knots in the log that can reduce the timber strength, pulping quality and appearance values. Timber clear of knots and other defects is called clearwood and is commonly prized for its attractive appearance and is used in furniture, flooring and joinery work. Knots larger than 5 or 6cm in diameter can result in timber being unsuitable for many structural grades, due to weakness around the knot. Pruning does not reduce the number of knots in the tree, only their size and location. The woody stem of live branches, other than those formed from epicormic buds, runs back inside the trunk of the tree to the pith. Pruning simply confines the branch knot to the core of the tree allowing the trunk wood to grow over it. 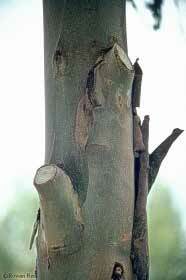 If all the branches on part of the trunk are pruned early, when the trunk diameter is small, then a clearwood sheath can develop over a core of branch stubs. On milling, clearwood timber is sawn from the sheath and the core discarded or sawn for lower grade timber. A 20cm core in a log with an underbark diameter of 60cm means that almost 90% of the log volume is clearwood. The central knotty core will also contain the pith and juvenile wood that is often discarded due to poor wood characteristics. Farmers are advised to aim for underbark log diameter at least three times the size of the knotty core diameter to allow large dimension clearwood timber to be easily sawn from the log. In some cases the knotty core of specialty timber species may produce sawn timber with interesting character if branches are pruned when small and live. (a) No pruning and the use of competition to promote self-pruning. The dead branches are commonly held for many years after they die. The competition necessary to induce self-pruning also suppresses diameter growth, resulting in the need for a longer rotation. (b) No pruning with heavy thinning to promote diameter growth. Results in large diameter and large branches and low quality timber. Pruning without heavy thinning. 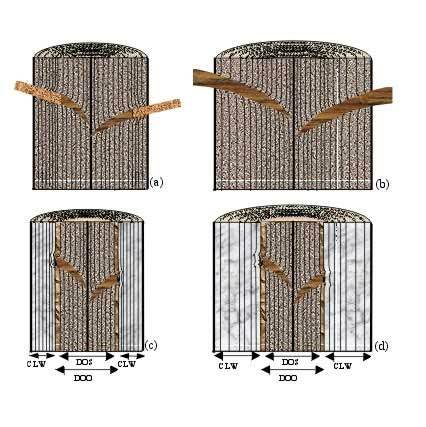 Causes knotty core control and a high timber volume per hectare but competition suppresses diameter growth, resulting in the need for a longer rotation. (c) Pruning with heavy early thinning to minimise competition. Results in knotty core control and large diameter. Results in maximum clearwood production in the shortest time but at the cost of total volume per hectare and the quality of the unpruned portion of the tree.